The Raiderettes come out to an Oakland Athletics game at Oakland-Alameda County Coliseum to serve root beer floats to fans to raise money for various charities and causes, Sunday, July 1, 2018, in Oakland, Calif. The Raiderettes, Junior Raiderettes, and parents on the second day of Junior Raiderettes practice at the Oakland Raiders Practice Facility, Sunday, August 19, 2018, in Alameda, Calif. The Raiderettes and Junior Raiderettes before the Oakland Raiders game against the Green Bay Packers at Oakland-Alameda County Coliseum, Friday, August 24, 2018, in Oakland, Calif. The Oakland Raiders won 13-6. 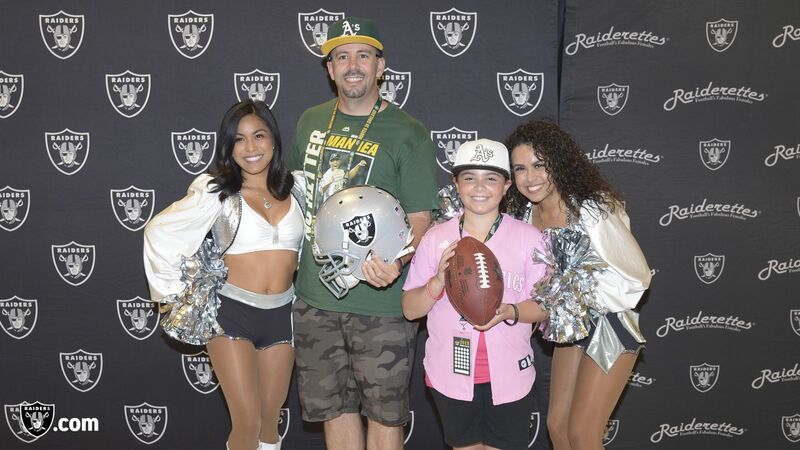 Oakland Raiders alumni and the Raiderettes visit Foothill High School to celebrate the kickoff of the Clark County School District high school 2018 football season, Friday, August 31, 2018, in Henderson, Nev.
Oakland Raiders alumnus Raymond Chester and the Raiderettes visit Oakland High School to celebrate the kickoff of their 2018 football season, Friday, September 7, 2018, in Oakland, Calif. The Raiderettes greet fans at Raiderville before the Oakland Raiders game against the Los Angeles Rams at Oakland-Alameda County Coliseum, Monday, September 10, 2018, in Oakland, Calif. The Oakland Raiders lost 33-13. The Raiderettes greet fans during the Oakland Raiders game against the Los Angeles Rams at Oakland-Alameda County Coliseum, Monday, September 10, 2018, in Oakland, Calif. The Oakland Raiders lost 33-13. The Oakland Raiders collaborate with the Oakland Police Activities League (PAL) to promote a brand-new NFL FLAG Football League by leading local elementary school students through flag football drills and games, Tuesday, September 11, 2018, in Oakland, Calif. Joining PAL officers are Oakland Raiders players Keith Smith, Tahir Whitehead, Rashaan Melvin, Maurice Hurst, Kolton Miller, and Marquel Lee. The Raiderettes greet fans at Raiderville before the Oakland Raiders game against the Cleveland Browns at Oakland-Alameda County Coliseum, Sunday, September 30, 2018, in Oakland, Calif. The Oakland Raiders won 45-42. The Raiders, Golden Knights, Las Vegas Metropolitan Police Department and Clark County Fire Department team up to bring the community together in recognition of the one-year anniversary of One October by providing lunch and spending quality time with those those first responders, at Las Vegas Metropolitan Police Department, Tuesday, October 2, 2018, in Las Vegas, Nev. Representing the Raiders are safety Erik Harris (25), linebacker Kyle Wilber (58), linebacker Marquel Lee (55), and the Raiderettes. The Raiderettes tour London before the Oakland Raiders game against the Seattle Seahawks at Wembley Stadium, Sunday, October 14, 2018, in London, England. The Oakland Raiders lost 27-3. The Raiderettes greet fans at Raiderville before the Oakland Raiders game against the Indianapolis Colts at Oakland-Alameda County Coliseum, Sunday, October 28, 2018, in Oakland, Calif. The Oakland Raiders lost 42-28. The Raiders, represented by alumnus Chris McLemore and the Raiderettes, help remodel the Ronald McDonald House Charities playroom (RMHC) and give the RMHC van a facelift for families and children receiving inpatient and outpatient medical treatment at local hospitals who live more than 30 miles outside the Greater Las Vegas Area, Tuesday, October 30, 2018, in Las Vegas, Nev. The Raiders Foundation, in partnership with the USO Las Vegas, hosts a fun event for current military members and their spouses to compete in a 6 event combine to fundraise for the USO Las Vegas at the Warrior Fitness Center at Nellis Air Force Base, Saturday, November 10, 2018, in Las Vegas, Nev. The Raiderettes host a joint practice with Nor-Cal Elite Team Gemini, a special needs cheer team, at Burrell Field, Saturday, November 10, 2018, in San Leandro, Calif. The Oakland Raiders, represented by alumni Chris McLemore and Roy Hart, and the Raiderettes, travel to University Medical Center of Southern Nev to visit and interact with young patients and their families, sign autographs, and take photos, Tuesday, November 13, 2018, in Las Vegas, Nev. The Raiderettes are featured in the annual Holidays/Santa's Arrival Parade as they proceed in convertible cars through Town Square, Friday, November 16, 2018, in Las Vegas, Nev. The Raiders Foundation hosts a Toys for Tots drive where guests have the chance to meet Oakland Raiders linebacker Jason Cabinda (53), linebacker Marquel Lee (55), and defensive tackle Maurice Hurst (73) in exchange for a toy or $20 donation to the charity, Tuesday, December 4, 2018, in Hayward, Calif. The Gridiron Griddle community breakfast supports the Boys & Girls Club of Southern Nev by donating all proceeds from the event towards the organization's scholarship program, Wednesday, December 5, 2018, in Las Vegas, Nev at Lied Memorial Clubhouse. The Raiderettes greet fans at Raiderville before the Oakland Raiders game against the Kansas City Chiefs at Oakland-Alameda County Coliseum, Sunday, December 2, 2018, in Alameda, Calif. The Oakland Raiders lost 40-33. The Raiderettes with Nor-Cal Elite Team Gemini before the Oakland Raiders game against the Kansas City Chiefs at Oakland-Alameda County Coliseum, Sunday, December 2, 2018, in Alameda, Calif. The Oakland Raiders lost 40-33.